Lightly grease a 9×13 inch baking dish. Arrange half the bread cubes in the dish, and top with cream cheese cubes. 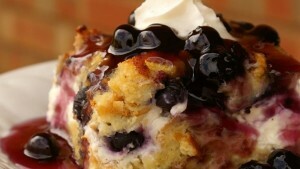 Sprinkle 1 cup blueberries over the cream cheese, and top with remaining bread cubes. Have an awesome day! Would love your thoughts on this delicious dish!